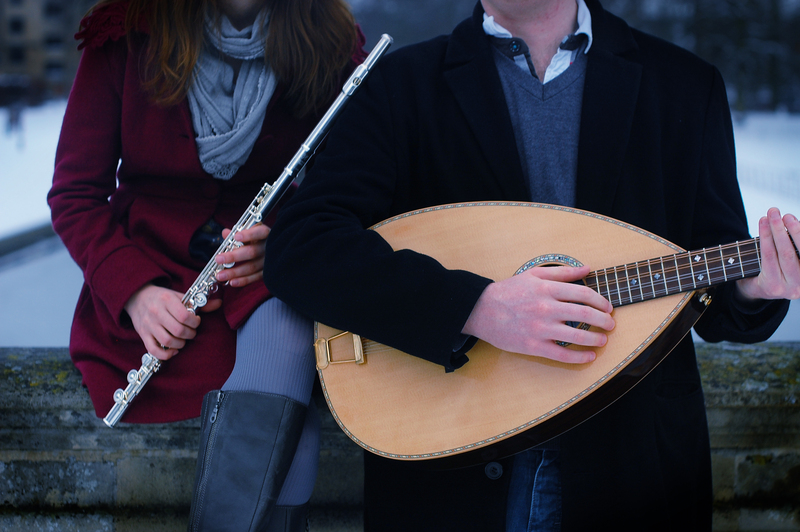 Two's Company are Alice Baillie (voice, flutes) and David Jenkinson (voice, guitars, mandocello). Originally hailing from Norfolk and Yorkshire respectively, they are currently based in Bristol and Sheffield. 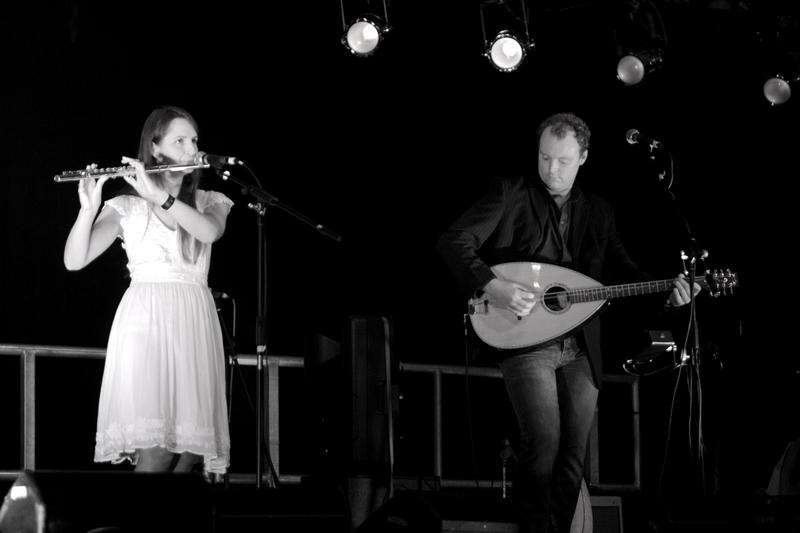 Their music places contemporary folk stories alongside age old tales of joy, sorrow and acclamation. 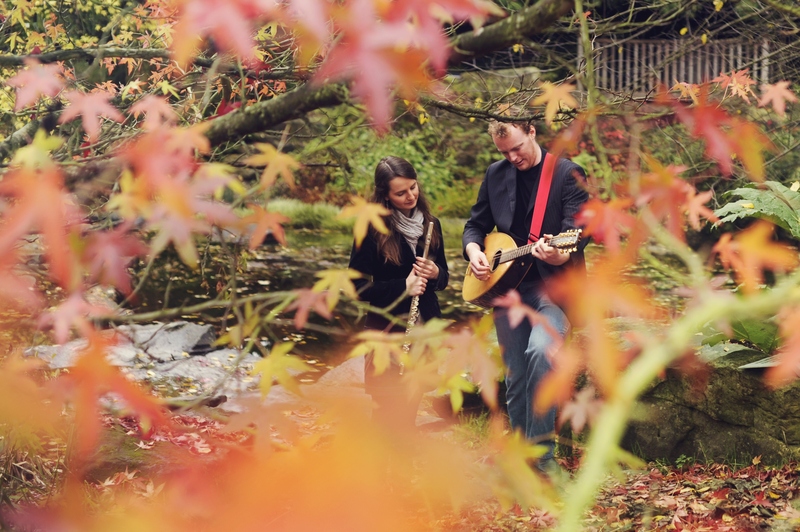 Taking inspiration from themes as diverse as the natural world, the industrial revolution and ancient myths and legends, they blend traditional material with self-penned songs and tunes to dazzling effect. Alice's voice reaches into the very heart of her own lyrics as well as those inherited from generations past. David's mandocello and guitar set a new backdrop for each tale, while flowing harmonies and soaring flute melodies bring the stories to life. Since their formation in 2011, Two’s Company have played across the country, with highlights including support slots for the likes of Martin Simpson and Phil Beer, winning the Shrewsbury Folk Festival Open Mic competition (2014) and reaching the final of the New Roots Competition (2016). 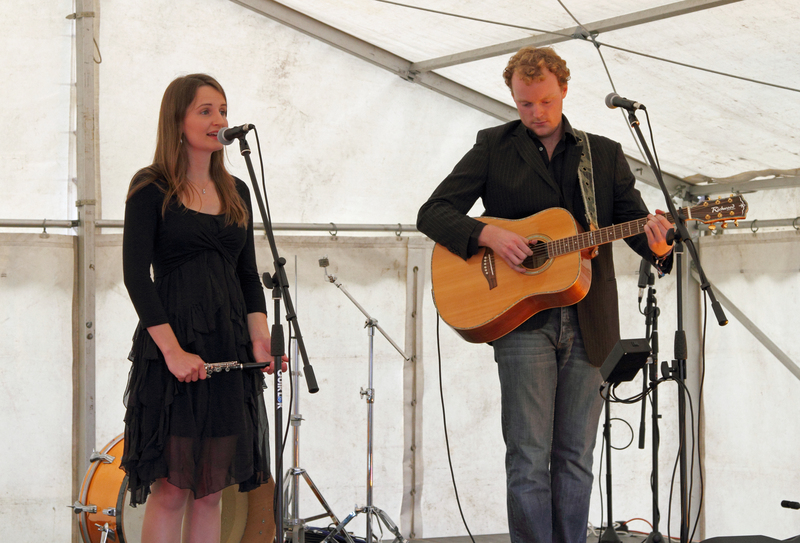 Their debut album ‘Go Together’, released in Autumn 2016, was heralded as ‘a welcome start to a recording career’ (Bright Young Folk) and ‘a courageous first album’ (The Living Tradition), and received radio play up and down the UK. David's two cello-mandolins were handmade by the late David Oddy and his son Nick Oddy. For more information on Nick's beautiful range of masterfully crafted instruments, check out the David Oddy & Son website. Alice can’t remember a time before she sang, but discovered her love of song-writing much more recently. Her earliest encounters with folk music were thanks to a pile of well-thumbed copies of ‘Singing Together’ and ‘Rhythm & Melody’ at home, learning the melodies by playing them on the recorder, or later the flute. While growing up she was inspired by the singers of the ‘60s and ‘70s rather than the music of the day, but the music that she performed was driven mostly by what was on offer around her – a melee of choirs, orchestras and musical theatre. It wasn’t until meeting David at University that folk music took over. David’s musical journey started at an early age – but not as a ‘folkie kid’! He took up piano aged 4, and trumpet aged 8. Having spent his early teenage years playing across the jazz, big band and classical genres with the latter instrument, he bought his first guitar on a whim, aged 15 – a non-descript fender imitation electric guitar. A year later, the first of his now ever-growing collection of acoustic instruments (a Vintage 6-string) followed, along with a first folk festival – Fairport’s Cropredy Convention. Watching acts like Kerfuffle, Seth Lakeman, and most fatefully, Show of Hands, David fell for folk music and has never looked back since. Now an accomplished multi-instrumentalist, David draws inspiration from the playing of various names you might expect – Kris Drever, Jim Moray, Steve Knightley – and the music of some you might not – Ed Sheeran, Bryan Adams, Green Day. A professional design engineer by trade, David holds a Master’s degree in Mechanical Engineering, and spends his working days designing, assessing and validating the mechanical integrity of an array of structures and mechanical systems. But it is his time spent in the musical world, whether performing, in the audience, or in sessions, where he ultimately feels at home.